I’m not buying any more games. It started out as a January thing, but now I’m thinking I should extend it to 6 months. No new games in 6 months. Play games from the backlog instead. My backlog would probably last me 2 years, but I think 6 months is enough to pick up all the pearls I’ve neglected for years. Titanfall 2 is one of those pearls. I’ve heard that the single player campaign is supposed to be really good, so I bought it when it was on sale. Can’t have paid more than $5 for it. This is a pretty straight forward FPS with a few quirks. 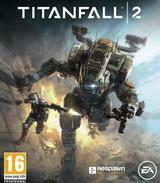 You play as rifleman Cooper that gets hold of a titan and the ability to act as a titan pilot. As a pilot you can do all manners of tricks, double jump and run on walls. It’s all in the helmet if I understand this correctly. The titan is what makes this game special. It is a huge tank on two legs. You can fight beside it, or jump into it and control it. The effect is really cool and it doesn’t get old during the whole campaign. You could almost say its two different games in one. The game play is very fast and furious. I set the autorun on, so my character runs when I'm not actively aiming. The effect is that you're running, sliding and throwing yourself at the enemy - and I find that I punch people in the face more than I actually shoot them. It is high speed action fun! At the start of the game I was afraid that they wouldn’t handle the situation with the titan well. It felt like I would have to go through puzzles the whole game based on me being small and my titan being big, but the developer doesn’t fall into that trap. They weave the game play between big and small together, so it feels like one fluent motion. It is really well done and I applaud them for it. The game also starts up with a lot of metal corridors and sewers, and I start to think I will spend two hours in tight dark spaces, but then it soon opens up under a clear blue sky. The game shifts the environments pretty often and it also reinvents the way it plays. The game story is what you can expect from a FPS, but I really like the kind of bond you make with your titan. The titan is more than just a tank. It becomes a companion through the campaign and I start to care about BT. I think the dialogue written between the titan and the pilot is quite good. By the end you have this epic Mass Effect style finale where you jump from spaceship to spaceship in a hunt to save the world, and at the same time you fight off other titans attacking you. The game is worth playing for just that scene, it is marvelous. Is there anything I don’t like about this game? Well, I don’t like FPS but this one is quite all right. The whole game is pretty much one long corridor that branches out at times, but still. The mobs doesn’t change much over the course of the game, and the bosses are pretty much indistinguishable from each other. However if you feel like playing a really good FPS that is not too long, this is the game!